There comes a time in everyone's life when they deserve to feel special, when they get the Royal treatment. I guess my time was now. 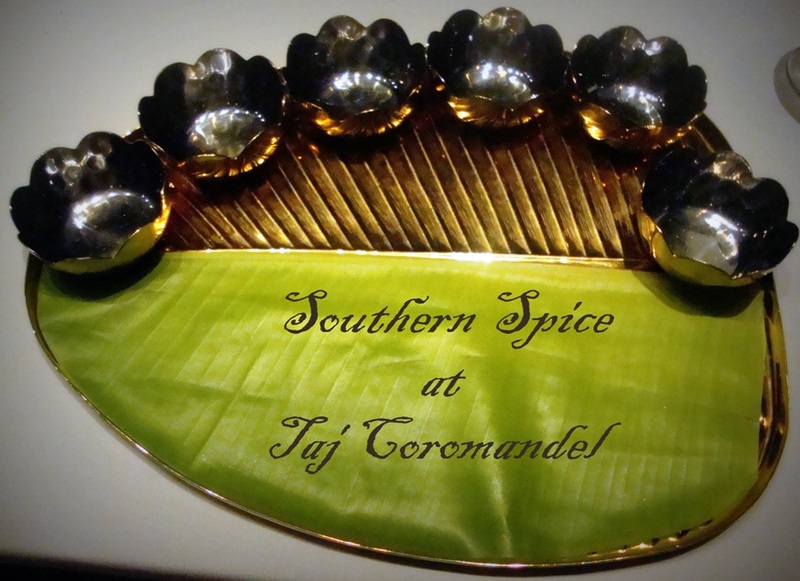 There I was walking into Taj Coromandel and stepping into the grand Southern Spice. It has been 4yrs or more since I was here last. Yes, Dec2008 I was practically living in the Taj [for an event], and morning breakfast those 3days was at Southern Spice. But the space I had walked into tonight resembled nothing like what I remember from my earlier visits. That is how the place had changed. It now reminded me of a royal ballroom, tall pillars, rich upholstery, cutlery that looked like it belonged in a palace and more. We were directed to one of the private dining areas adorned with a long table, a beautiful piece of art on the ceiling and a piece on the wall displaying the various rulers of Karnataka, the Wodaiyars if I am right. We were greeted, seated and treated. A brief round of introductions, a few words about the Maha virundhu that awaited us and the 1st of the dishes started coming to our plates. Oh wait, did I mention how beautiful the plates looked. Look at the pictures and you will know what I mean. 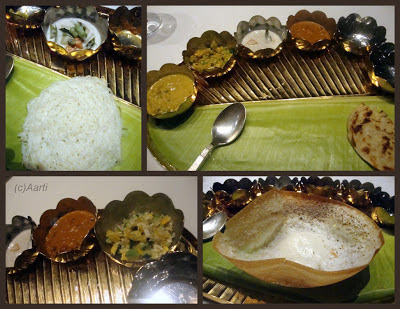 We were served dishes from across the regions down South, Karnataka, Kerala and Tamil Nadu, each one unique, each item distinct in flavour, appearance and textures. We were told that the Chefs had scouted the regions extensively gathering recipes, sampling dishes and had chosen the finest of them all and incorporated them into the menu. South Indians are indeed known for their hospitality. 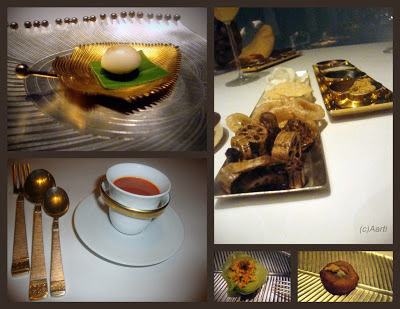 And keeping with this tradition, the dedicated staff in the private dining area made sure our plates were never empty. 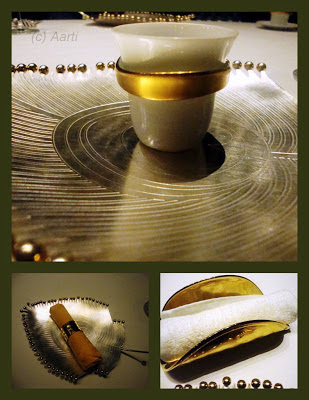 After the appetizers, a plate with small bowls landed in front of us. Shimmering against the light, they were soon filled with gravy and vegetable curries, each one outdoing the other. The highlight of the evening were Asparagus Paruppu usili, Edomame Kurma (Pookose urlai kurma), Zucchini thengai curry (Zucchini kaara poriyal), the light and flavour filled vegetable stew (Pachakari ishtew) and Channa gravy (Kadala gassi) . The non vegetarians had their share of delights as well. 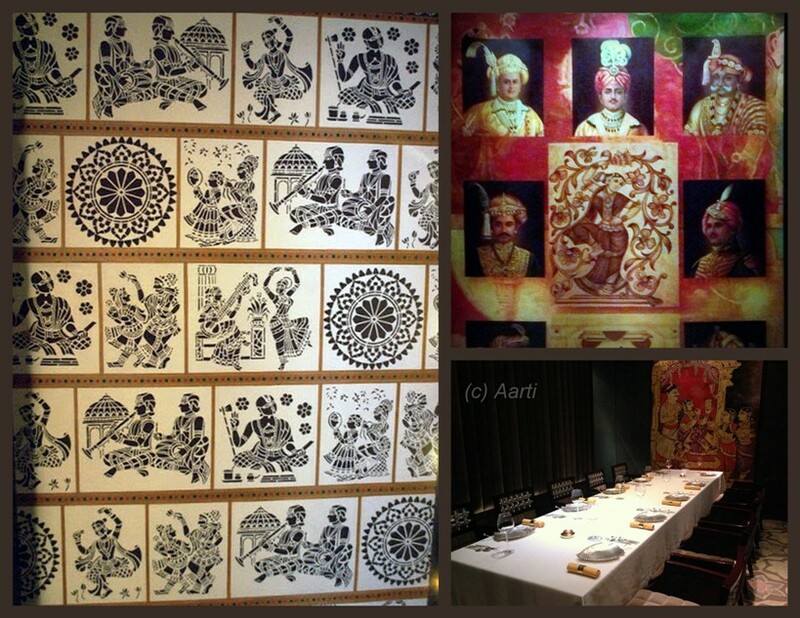 Each of the dishes had a South Indian touch but were unique. I would have never thought of making Asparagus usili, leave alone stir fry zucchini with coconut. We were served Aapam, Idiyappam, parotta for these dishes. Wait, they were not done yet. Next came plain white rice, some ghee, a sprinkle of paruppu podi that was hard to resist. I loved it. There was also Arachivitta Sambar [a recipe from Chef Anand's home kitchen] and finally, there was the grand entry by the humble curd rice. 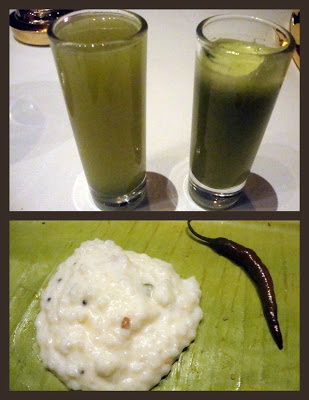 We had the option of vetha kuzhambu, mor milagai vathal, and pickles for this finale... We were all stuffed. Before we knew it, we had managed to go through not 10 or 20, but nearly 30 dishes. Now, it was time for desserts. 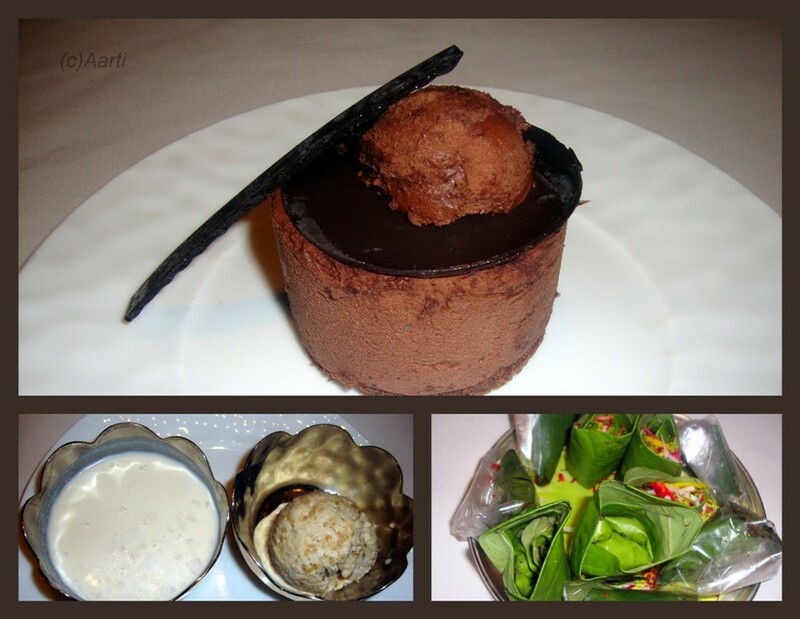 After much pleading, the Chef gave in and served us a few portions of the 2 desserts that were part of the Maha virundhu. There was the delicate elaneer payasam - a recipe from the MRF Mammens' family served alongside a cup of Godhi-bella ice cream (banana jaggery wheat ice cream). And there was one more dessert- Belgian chocolate mousse cake filled with coconut and jaggery fiulling that oozed out when you cut into the mousse (Chocolate purnam mousse). What a pleasant surprise it was. This Mahavirundu is fit for a King or a Queen. It is served to large groups who are looking at a beautiful experience, not just good food. Priced at Rs5000+ taxes, there are various other packages as well. If guests seek a meal with local wine, it is a different rate, international, and so on- you get the drift, right? ~! As we bid the team Good night, the clock was ready to strike 12 and a new day awaited us around the corner. Where did the evening go? Next time you are in the mood for something Royal, you know where to head..